Cumulus is derived from a Latin word meaning a heap or an accumulation So, cumulus is a cloud piled up high. Accumulate is from the same root. Summer is cumulus time. Certainly, the cumulus cloud can be seen any time of the year, but for really good cumulus watching, pick summertime. 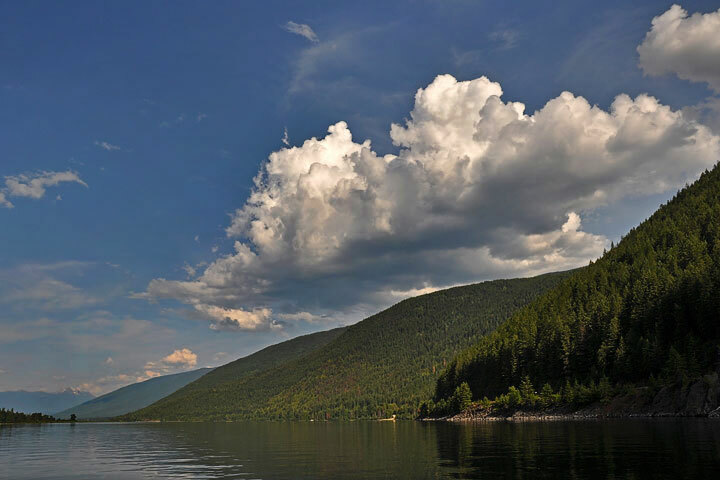 Cumulus clouds grow to their greatest heights over the mountains and then drift over the Lake and dissipate. 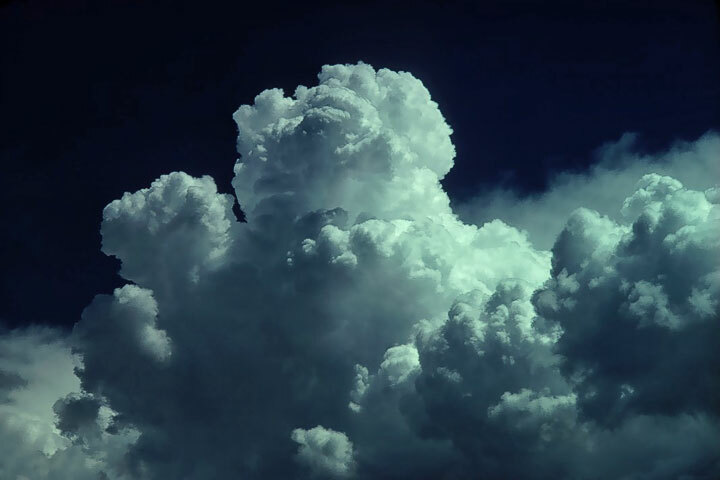 Cumulus clouds grow in an unstable atmosphere: an atmosphere in which a parcel of air that is displaced upwards, becomes buoyant and so is accelerated upwards (rather than back down to is original location). This instability depends upon the temperature and moisture structure in the atmosphere. Adiabatic cooling The condensation in a cumulus clouds is produced by vapour cooling. But the cooling, called adiabatic, involves no external heating or cooling. Rather, it is merely that as parcels ascend through the atmosphere, the pressure decreases, the vapour expands, and the temperature drops. The drop in vapour temperature results in the condensation. The growth of the cumulus cloud is normally initiated at the sun–warmed ground where smallish buoyant bubbles of air begin to rise. Called thermals, these parcels of air entrain surrounding air as they rise and so grow progressively larger. However, as the thermals rise through the atmosphere they undergo adiabatic cooling (see box). At some point, the vapour in the thermal has cooled sufficiently that it begins to condense and a cloud forms. The height at which this happens is called the lifting condensation level and it at a fairly uniform elevation over the region: cumulus clouds have a flat base, all about at the same elevation. Once cloud drops form, the behaviour of the thermal shifts somewhat. The thermal is constantly entraining (incorporating) surrounding air, so it makes a difference whether it is rising through otherwise clear air, or is climbing through the cloudy remnants of previous thermals. If it is the first thermal to rise through the lifting condensation level at this spot, it will be ingesting clear air from the surroundings. This leads to evapouration, cooling and loss of buoyancy. On the other hand, if the thermal is rising through the cloudy debris from previous thermals, it is ingesting other cloudy air. It will not loose buoyancy and will continue to rise. Cloud watching For a cloud watcher, one of the delightful characteristics of the cumulus cloud is that the parade of thermals punching through the cloud top and then sinking and becoming ragged, all takes place on a nicely watchable time scale. The cumulus cloud grows as a result of a succession of thermals, each of which can rise farther than the last by virtue of climbing through protective surroundings. As the thermal climbs into the clear air above the cloudy debris, it in turn looses buoyancy and and settles back to provide a protective environment for the next thermal. The bright hard–edged portions of the cloud characterize the newly emerging thermals as they rise into the clear air; the darker raged portions of the cloud constitute the debris left behind after evapouration has taken its toll. 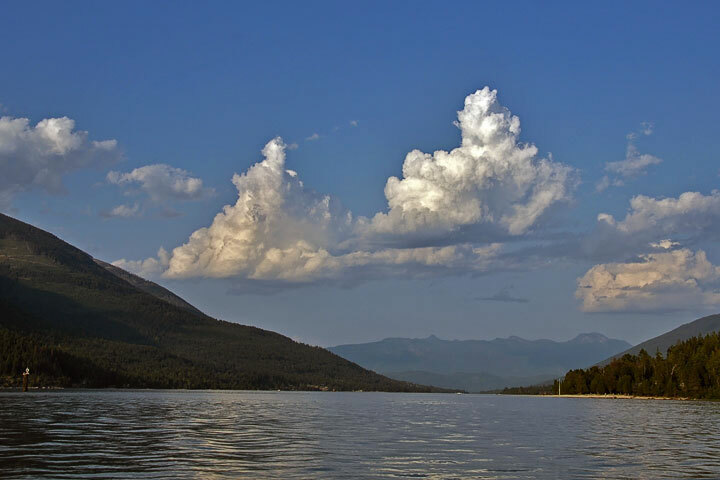 Cumulus clouds grow preferentially over the mountains rather than over the waters of the Lake. The temperature of the air adjacent to the sunlit mountain slopes is higher that of the air at the same altitude over the valley. This mountainside air, being buoyant, produces thermals which rise, pass through the the lifting condensation level and become filled with cloud drops. Vigourous thermal In the centre of the picture, a rapidly rising thermal has ascended into the clear air. As it engulfs some surrounding clear air, evaporative cooling will cause it to loose buoyancy and it will sink as others before it have done. Cumulus clouds over the Lake Having grown over the mountains, cumulus clouds are then often carried over the Lake by the wind. They now loose their source of new thermals and so slowly become ragged and dissipate. The prominent thermal, in the cloud on the middle right, is unlikely to be followed by any more.